New Delhi .24 July 2018. India is on the way to develop its own sovereign capabilities in the future. Five Indian students will be embarking the highest level of education from the prestigious ISAE-SUPAERO in Toulouse, France with the opportunity to expand their networks and immerse themselves in the French and European culture and way of life. 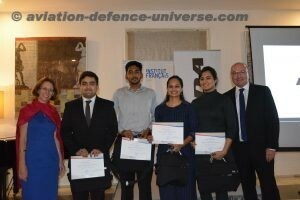 Claire Thuaudet, Deputy Head of Mission, Embassy of France in India, welcomed MBDA-ISAE scholarship winners at the Residence of France in New Delhi, at the award ceremony to celebrate their achievement. Supporting the cause of ‘Make in India’ policy which encourages prime use of domestic skills and manufacturing within India, this development programme also builds up skills of Indian defence professionals, provides commercial knowledge and international understanding. The main role of the ISAE-SUPAERO Foundation is to expand its national and international footprint, in particular by fostering the international mobility of students and research faculty. It helps in financing new pedagogical projects and help students engage in research. Indian students, who were given scholarships, will be awarded an internationally accredited Msc in Aerospace, Mechanics and Avionics from ISAE-SUPAERO. These individuals are graduates from different Indian Institutions and are chosen by an admissions panel of ISAE. These students will get access to the benefits like visa fee waivers, medical insurance coverage, affordable accommodation, etc offered by Embassy of France and living expenses contributed by MBDA.